The 2-hour drive makes it worth it for me, since I can make it a single-day getaway that doesn’t involve any hotels or massive prep. But I’ve got to be up front with you, getting the most out of a massive conference like this depends on what you’re looking for: there’s tons of awesome things to do at MAGFest, but for me, I have one goal — meeting game devs. For that, the event is a tremendous value (especially at only $80 a ticket). 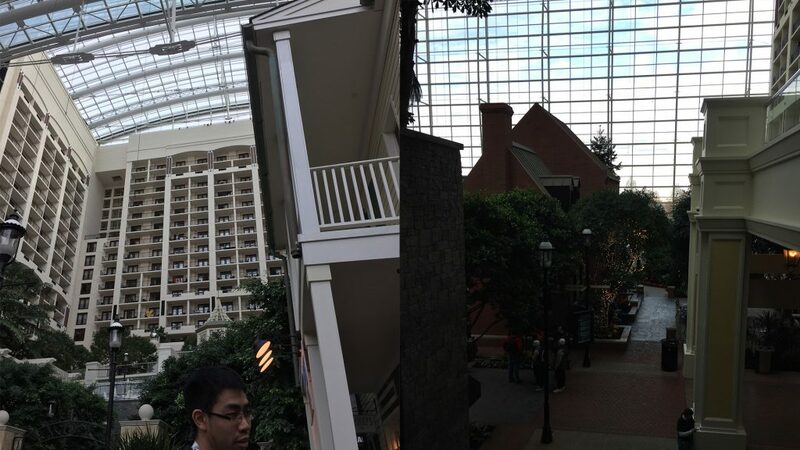 The venue is massive: with a dedicated island-like area on the Potomac’s National Bay, Gaylord National Resort is so huge that it’s open indoor atrium is the size of a village. It’s not unreasonable to just gawk at how nice and huge everything is. With size, however, it’s also reasonable to get a little lost, fortunately, the staff is very helpful for finding the reception and getting where I needed to go, which was the expo hall where they were showing indie games — conveniently stationed between the sprawling merch hall, the massive arcade, and the less-massive pachinko machine arcade (but still quite impressive that they had that!). I wouldn’t have MAGFest on my radar if it weren’t for Quadradtron Games, for whom I did my second-ever trailer (for Threshold). Their partners, Zenas Bellace and Christian Plummer told me it’s become their favorite venue, so I was sure to make them my first stop. Unfortunately, Christian was rendered unconscious by some malevolent food, so I was only able to meet-up with Zenas. Still, I’m excited that I could see how their local multi game, Super Rock Blasters, was shaping up into something very attractive to look at. 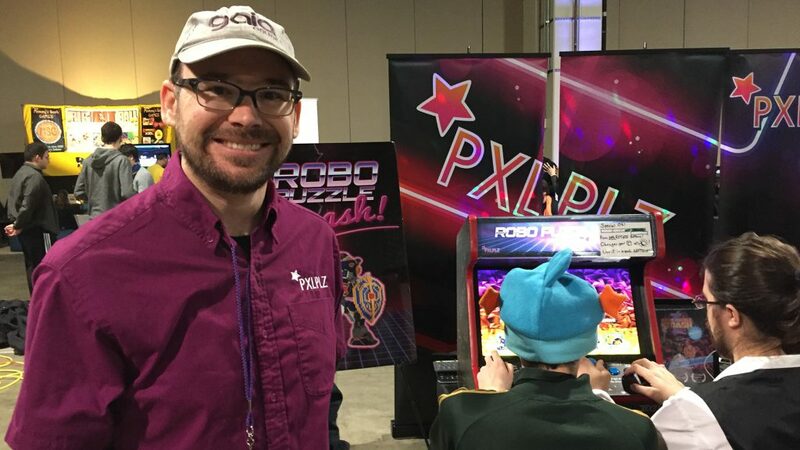 I loved being able to catch up with Ben from PXLPLZ games and checking out his booth for Robo Puzzle Smash. The dude is always full of cheer, and his puzzle fighting game is wildly unique. I can’t wait to share it with my wife, who always destroys me at Dr. Mario. 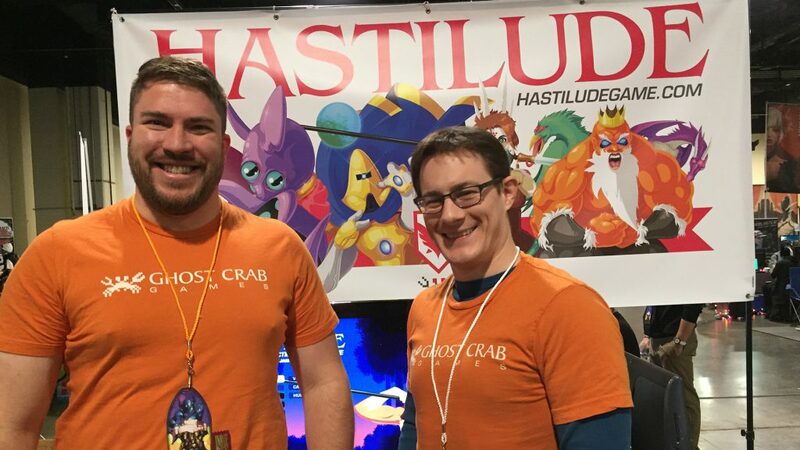 Two experiences stood-out to me: the first is meeting Chris and Dustin from Ghost Crab Games, playing their unique local multiplayer game, Hastilude. I loved how the game made sure that each character you played felt unique, and how there was simple to learn controls, but difficult-to-master depths, which only became apparent when we tried the survival mode. Each character can fall off of their mount (the first of two hits), but then they can jump in another player’s mount to recover that hit point, but then their style of movement is designated by the mount they’re in. So you can have a widely varied play experience even within the same life. It’s a rich game, that I can’t wait to share with the game group that meets at my house. 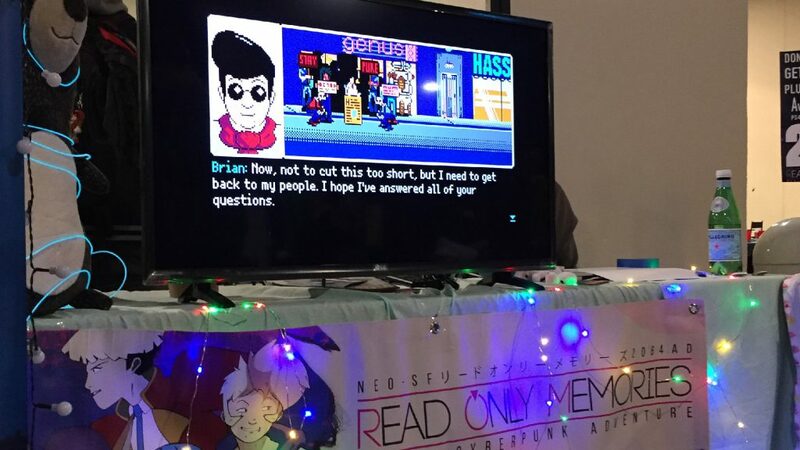 Second, I loved meeting Matt Conn of Midboss, the creator of Read Only Memories 2064 and the GaymerX convention. I didn’t realize who he was at the time, only that he sprinkled cracked pepper on the back of my hand as I stood there, confused but amused. This he did as he told me about his friends game, A Purrato Tail, a game about potato cats. Next, Matt told me about the framework behind Read Only Memories, as I was familiar from my friend Daniel’s Gamechurch article on the game, but I had not played the game. I knew that it was about fifty years in the future when LGBTQ rights have well-since been secured and the social issues turned more towards trans-humanism and technological integration, but I didn’t know what it was like to play or what the 2064 version was about (it’s a fully-voiced update). After talking to Matt, I had to sit down with his game, even if Visual Novel style games are not my jam. It was a pleasant experience, but there was something much more memorable about meeting Matt himself — that went beyond the cracked-pepper. 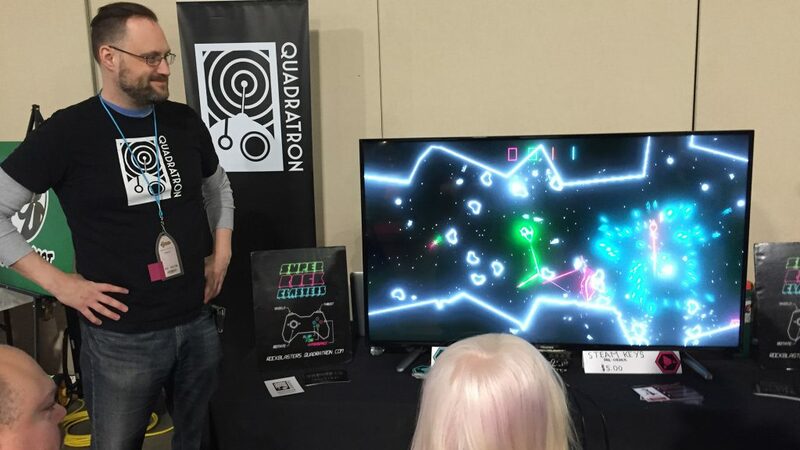 After checking out “all” of the rad indie games, I realized there were many games I shamefully missed. Tragically, I missed a few games that have some instant win factor. Most notably, BattleSloths. I mean, c’mon! It’s about sloths that battle! And I definitely didn’t get to spend as much time as I would have liked with some of the quieter and more meditative games. But I did get a few minutes in the arcade, where I got to try some extremely rare games like Taiko Drum Master and Sega Golden Gun — big highlights for me. 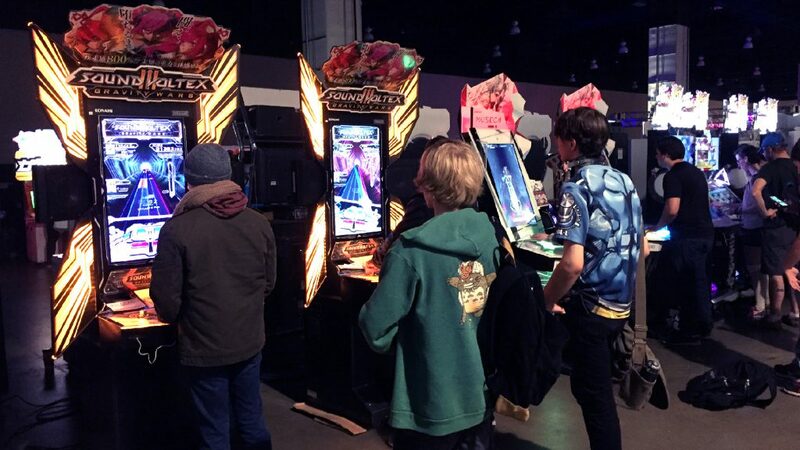 If you’re thinking about MAGFest for showing-off your indie game, it seems like an unparalleled value, especially since indie games are given more priority to shine than something like PAX.